STANFORD TEAM AWARDS - June 9, 2012 - The Knowles Family Director of Men's Golf, Conrad Ray, announced the team's year-end awards today. The annual awards honored five separate members of the 2011-12 squad and were voted on by the team and coaching staff. Freshman Patrick Rodgers received both the Steele Award for the freshman with the lowest stroke average as well as the Team's Most Valuable Player. 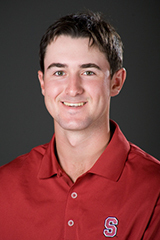 Rodgers managed a 70.68 stroke average over 37 rounds and played every event for the Cardinal. Only two Stanford players have ever achieved a lower stroke average (Joel Kribel in his Senior year and Tiger Woods in his sophomore year) and it is the lowest ever by a Stanford Freshman. With two wins and three top 5 finishes, Rodgers placed in the top 10 in ten out of his twelve collegiate tournament starts. His performances earned him Ping First Team All-American as well as Hogan Award Finalist honors. Rodgers was a member of the US Walker Cup team in 2011, and will represent the US in the 2012 Palmer Cup matches. He is currently the #2 ranked player on the R & A's World Amateur Golf Ranking. Freshman Patrick Grimes was awarded the team's Most Improved Player award. Grimes competed in six tournaments for the Cardinal team this year and played three events as an individual. His low round of 66 (-6) came at the Amer Ari Invitational in Hawaii. Since March, Grimes has been able to shave a full stroke from his scoring average and become a solid contributor within the traveling team. Junior Andrew Yun, who has been selected by the Golf Coaches Association of America (GCAA) to play his second consecutive Palmer Cup at the end of this month, was voted recipient of the team's Stanford Tradition Award. This award is given to the player exhibiting leadership, strong work ethic, academic excellence, and an overall appreciation of the traditions of the University and Stanford Men's Golf. The team votes reveal how his enthusiasm to tackle both academic and athletic challenges is widely respected and an example to follow. Finally, "The Spooney", which is given to the team member with the most tenacity and never give up attitude, was awarded to Senior David Chung. "Each player being recognized has had an opportunity to etch their name and unique contribution into Stanford Golf history. Our program is very proud of these young men who continue to blaze a trail for future years", said Head Coach Conrad Ray. STANFORD, Calif. - Three Stanford golfers - David Chung, Andrew Yun and Cameron Wilson - earned spots on the Pac-12's All-Academic team, as announced by conference commissioner Larry Scott. Chung, who carries a 3.40 grade point average as a communications major, and Yun, a sociology majors with a 3.40 GPA, both earned second team all-academic honors. Wilson (3.30; undeclared) was an honorable mention selection. To be eligible for selection to the academic team, a student-athlete must have a minimum 3.0 overall grade point average and be either a starter or significant contributor on their team. Patrick Rodgers and Andrew Yun earned first team All Pac-12 honors for the 2011-12 season. Patrick was named the Pac-12 Freshman of the Year recipient. Cameron Wilson earned 2nd team All Pac-12 recognition for his outstanding season. All-Pac-12 First Team selection ... Pac-12 Championships titlist ... ranked second on the team in stroke average (71.5) ... tallied six top-10 finishes in 11 events this season, including four top-five efforts ... currently ranked 12th among top individuals by Golfstat.com. PING First Team All-American ... All-Pac-12 First Team honoree ... Pac-12 Freshman of the Year ... one of three finalists for the Ben Hogan Award ... sensational rookie campaign netted 10 top-10 finishes in 12 events, including wins at the Fighting Illini Invitational and Western Intercollegiate ... shot par or better in 26 of his 37 rounds this season, including a season-low seven-under round of 65 in the third round of the Pac-12 Championships ... became the first Stanford freshman to win his first event since Tiger Woods, when he captured the Fighting Illini Invitational at Olympia Fields with a score of 206 (-4) on rounds of 68-70-68 ... Stanford's top finisher in 10 of the team's 12 tournaments this season ... finished with a stroke average of 70.7, representing the second-best single-season mark in school history along with Tiger Woods (1995-96) and Andrew Yun (2010-11). STANFORD, Calif. -- - Stanford sophomore Cameron Wilson earned a spot in the field for next week's U.S. Open at the Olympic Club by winning the sectional qualifier held today at the Canoe Brook Country Club in Summit, New Jersey. Wilson, a native of Rowayton, Conn., carded rounds of 71 and 65 to top the field which was trying to secure one of the four spots available from this qualifier. Wilson shot a one over-par 71 on Canoe Brook Country Club's South Course but closed with a blistering 65 on the North Course in the afternoon. "I'm so pumped right now," said Wilson. "My morning round was pretty mediocre. I made a bunch of birdies but I seemed to give one away after each one," Wilson said. "And I had four or five vicious lip-outs. When they started to fall early on in the second round, it just got the ball rolling. "I just stayed in a good mindset the whole time. I didn't get too excited or caught up in how I was playing, I just kept telling myself `you gotta make more birdies, you gotta make more birdies.'" Wilson recorded a total of 13 birdies on the day, including nine on his second round. Patrick Rodgers and David Chung, both playing in the Daly City sectional at TPC Harding Park and Lake Merced Country club, fell short in their attempts to land a spot in the U.S. Open field. Rodgers finished 16th after rounds of 71 and 70 while Chung tied for 74th after carding rounds of 74 and 73. Dodge Kemmer '09 finished 34th at 143 after rounds of 73 and 70. Joel Kribel '99 had a share of the first round lead at the Daly City sectional after shooting a 66 in his morning round at TPC Harding Park but turned in a 79 at Lake Merced in the afternoon and finished 52nd. Casey Martin '95, a member of Stanford's 1994 NCAA championship team who now serves as the men's golf coach at the University of Oregon, earned a return visit to Olympic by winning the sectional qualifier at the Emerald Valley Country Club in Creswell, Ore.
Martin, 40, holed a five-foot par putt in the dark to claim medalist honors in the Creswell qualifier, nipping Oregon golfer Daniel Miernicki by one stroke. Martin has not played the U.S. Open since 1998, when he tied for 23rd at The Olympic Club. Zach Miller '07 will have to wait until tomorrow to try to secure a spot in the U.S. Open field as the sectional qualifier at the Germantown Country Club in Memphis, Tenn. was postponed due to inclement weather.